J. Bouman with his previous bike: M5 Shock ProofIt's the third time J. Bouman participates and this time he has a blue M5 Carbon High Racer with a more than sufficient 60 litre Carbon Tail Bag. However, not only ample luggage capacity is provided, also air resistance is considerably less. Definitely an advantage at these distances and mentioned age. 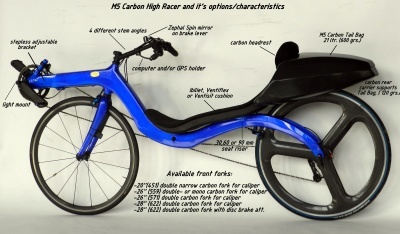 Since his transfer from an M5 Shock Proof with 26 inch wheels to the Carbon High Racer his cruising speed has increased by 6 to 8 km/h and weight of the equipment has almost halved. This is including all the extras: disk brake, Son hub dynamo and Tail Bag plus several other gadgets has nevertheless limited the weight to 11.5 kg. Interested in the progress of the race? Mr. Bouman and several other participants can be followed via their race number on the internet site of the organisation: suivi.paris-brest-paris.org/F035.html How come people do these rather extreme challenges? I found a nice quote by Jaap: "The most important is the fun of riding, but also the resulting good physical condition, so you don't feel reluctance to tackle everyday's challenges. Recumbent holiday coming up, but since the September 2014 stolen Carbon Shock Proof wasn't recovered yet, I decided to make a last minute sequel. Madness, producing a lightweight carbon bike with 26/28 inch wheels just two weeks before departure, while all other work had to continue as well. One lucky break was the existing carbon rear fork from the M5 TiCa Low Racer era. Nicely lightweight at 320 gram and a real work saver. The seat support came from the M5 Carbon High Racer. The frame diameter could be kept at relatively small diameter, since the weight of the rider is also low. 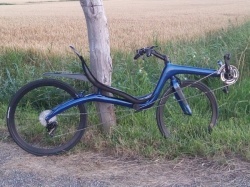 End result: a light weight bike (8.3 kg) with all cables inside the frame. The most famous example that I experienced myself in 1997 in what was the last opportunity to ride Den Store Styrkeproven Trondheim-Oslo (543 km non-stop). The Norwegian organization even dared to change the rules during the trip and the first prize (6000 +/- old fashioned guilders or +/- 2700 nowadays Euro's)) without even blinking their eyes, was donated to the first finishing roadie.... 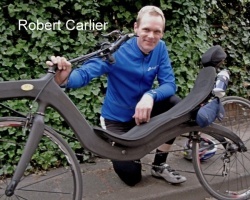 This ex-professional, Atle Pedersen, finished more than two hours after the fastest time I set with my M5 Low Racer recumbent .... After this version it was even forbidden for recumbent riders to ever take part. Motive of the organization: security !! In the following years of the TO event there has been many accidents, some even fatal. A more recent example, also Scandinavian, is the cyclo randonneur Vatternrundan in Sweden. 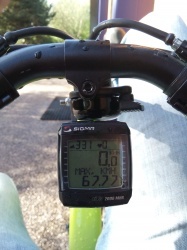 Very suitable recumbent terrain: rolling hills where much difference can be made with the rest. That tour is only to join with a recumbent by a doctor's statement .... Because, well educated as the Swedes are: excluding disabled is not really fair. The doctor's statement must contain that your physical health (eg hernia) hinders you from driving a upright bike. These statements can be obtained at M5 by the way! 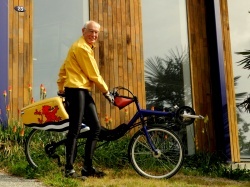 Ergo: History is repeating itself since the ban on recumbents to participate in professional competitions in 1934. It shows again how conservative especially cycling people can be even if the bare facts proove the opposite. If this conservatism was leading in the aviation, automotive, or sailing, we would now still fly double-deck planes, driving T-Fords or sail with straw made Viking boats.... Nostalgic but quite unrealistic . Great event to visit, even better to participate in the races! Follow link below for details. Telephone and e-mail traffic will continue on regular base in this period but the M5 showroom will be closed during our own bike vacation from july 21 st incl. august 22 nd. Let's see what's available for this "super randonneur"
It sure was a learning process... Trying no less than 15 types of carbon prepreg fabrics from seven different manufacturers. Also: which kind of agent releases the product best from the mould? Lots of difference there: varying from severe sticking to the mould to effortless loosening. Next came all kinds of foils and films, vacuum blankets, vacuum pumps, vacuum bags, oven arrangements, completely illogical oven control programs and two weeks ago to cap it all an imploding mould. 138 degrees centigrade sure bakes the product fast but proved to be a bit to much for the mould. Result: about one hundred hours of work lost and another delivery delay. We have now new moulds with heat resistant epoxy and from now on the baking temperature is lowered to around 110 degrees centigrade. Takes a bit longer, but the moulds and foils last much longer. 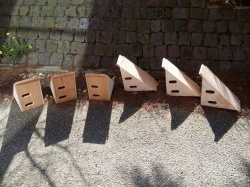 Anyway, the production process has started and the new prepreg cases are less than half a kilogram. So that's lighter than a 17 litre top bag. The possibilities to make nice and light weight products have increased significantly! 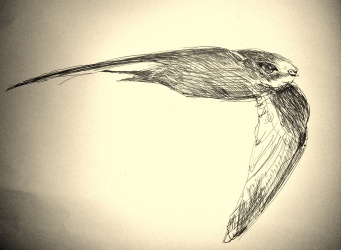 Despite the fact that it's high season in recumbent business there was a strong urge to finish a one-day project in order to help homeless swifts. A neighbouring farmer had just renovated the roof of his barn which led to the vanishing of breeding places for these wonderful birds. By installing these special double-deck wooden cottages we hope to eliminate this problem. Special thanks to Daniël Siepman for assisting with this in-between job. 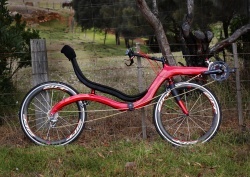 Very red from "down under"
Images by Paul WordenFrom our Australian customer Paul Worden we received these special images from his M5 Carbon High Racer which was assembled by himself.